Disability and Music Performance examines discriminatory social practices in music conservatoria, orchestras, music festivals and music competitions, which limit disabled people’s access to music performance at a professional level. Of particular interest are the disabling barriers that musicians with an intellectual, physical, sensory or neurological disability—or an acquired brain injury—encounter in the world of Western classical music, both as students and as professional performers. This book collects data in the form of semi-structured interviews and video and audio recordings to explore the voice, concerns and suggestions expressed by musicians with disabilities. 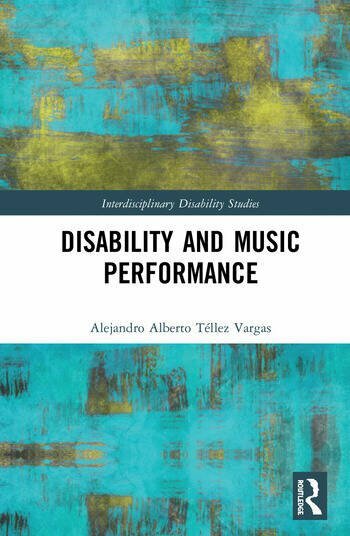 It examines their perceptions of both inclusive and discriminatory practices in music institutions as well as the representation of, and audio-visual recordings by, key musical figures with disabilities. Its findings aim to contribute to the wellbeing of musicians with impairments by challenging disabling social practices that see them as inferior. This publication offers performers, teachers and researchers new perspectives for exploring some of the most common social dynamics in encounters between normative audiences, musicians and music critics, and musicians with disabilities. It invites the reader to recognise disability as a rightful identity category in music performance and to dismantle the disabling barriers that limit the participation of disabled people in music-making. Alejandro Alberto Téllez Vargas completed his PhD in 2016 as an Endeavour Postgraduate Award Holder (University of Melbourne). In 2008, he received a Fulbright Fellowship for International Postgraduate Studies at the United States of America, where he studied a master’s degree in music performance with a related field of studies in music and medicine at the University of North Texas (UNT). Currently, he works at the Department of Education and Training of the Victorian Government, Australia.